I’ve known about Solardome® geodesic domes for nearly ten years, but it wasn’t until I joined the company this year that I got a full appreciation of the history of the geodesic dome construction, the materials like the Hastelloy C the use and how they can be made in a varieties of ways to customize the way people use them. I wanted to take you on a whistle stop tour of the past, present and future of domes and share with you some of the visionary stories I’ve encountered, so far, in dome design. The design principles of the Solardome® glasshouse are based on the revolutionary work of American inventor, architect, engineer, mathematician and cosmologist, Richard Buckminster ‘Bucky’ Fuller (1895 – 1983). In the 1940s he set out to create a ‘design science’ that would produce the best solution to mankind’s housing problems using minimal consumption of energy and materials. It was in the 1960’s however, that NATOs giant golf ball shaped radar dome designed by the Buckminster Fuller organisation caught the eye of an engineer living in North Yorkshire; if they can withstand these weather conditions then they would make the ultimate in greenhouse design. 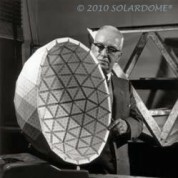 He explored the Buckminster Fuller geodesic domes and their principles and in 1969 designed and manufactured the first European geodesic dome, a 14’ 6” SOLARDOME® 2. For the next two decades Rosedale Engineers, his Yorkshire company, sold many 100s of stainless steel and aluminium low profile geodesic domes which ranged from 10ft to 20ft. The majority of these old greenhouse domes are still in use and loved today; a true testament to their strength and durability. In 1995 the company was sold and became the Solardome Industries Limited we know today. From these early greenhouse domes, Solardome® glasshouses evolved into a range of larger, taller glass buildings suitable for many applications – garden rooms greenhouses, visitor facilities, outdoor classrooms, the list goes on! The world of dome construction however really hit the press in March 2001 with the opening of the Eden Project, Cornwall. The idea was conceived by Sir Timothy Bartel Smit, who then put a team together to make the dream a reality, including architects Nicholas Grimshaw and Partners. The Eden Project consists of several bubble-shaped domes, made of hundreds of hexagonal and pentagonal inflated plastic (ETFE) cells, supported by steel frames. Under one of the domes, the 50m tall Rainforest Biome, grows the largest rainforest in captivity. The Biome covers 1,56 hectares and is presently the largest ‘glasshouse’ in the world. 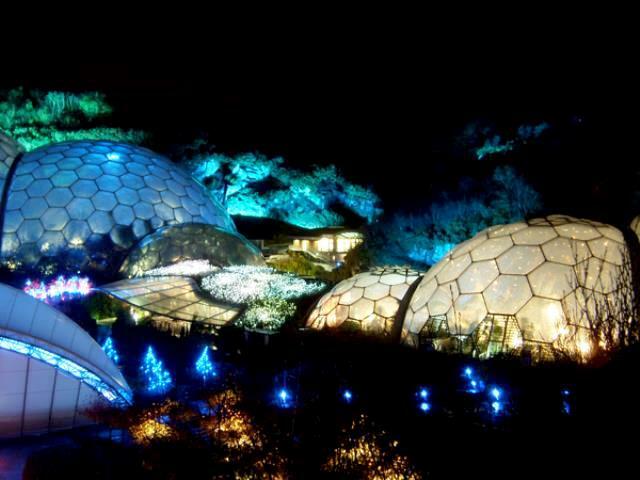 The Eden project seemed to inspire many people to want a dome, but the most interesting outcome, in my opinion, was the adoption of domes as outdoor classrooms in schools. In 2003, Neston Primary School were the first to order a Solardome® glasshouse for their school and since then Solardome Industries has gone on to install domes in over 60 schools. Solardome Industries is now a world leader and expert in aluminium geodesic domes, and 2012 saw the launch of a new era of Solardome® geodesic dome construction with a SOLARDOME® PRO architectural system. 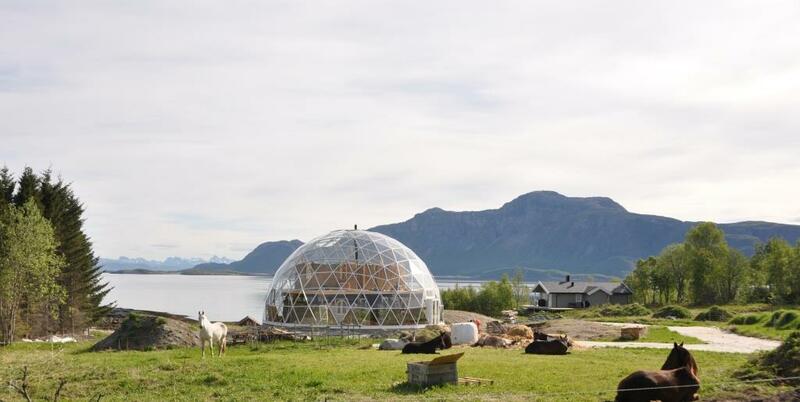 This innovative new system allows the manufacture of bespoke geodesic domes up to 25m diameter, quickly and cost-effectively, and also provides greater flexibility in design and dome applications. A key advantage to the new PRO system is that it can be clad with any type of material incorporating single, double glazed and insulated panels into the design and also eco features such as solar panels. The first geodesic dome using this system was installed summer 2012 on a remote Norwegian Island near Bodo, in the Arctic circle. This SOLARDOME® PRO dome is a 6mm single glazed, 15m diameter geodesic dome (7.5m tall at the centre) and protects an eco-home within it. So what does the future hold for the world of dome construction? This year will see the completion of three more SOLARDOME® PRO domes, two in Austria and the first one in the UK. In Austria one dome sits as an impressive skylight over the atrium of a double storey visitor centre, the other combines double glazing and wooden insulation panels to create a magnificent new home. The UK dome at Salford City College will feature as a unique and stunning canteen at the heart of the colleges’ brand new state of the art FutureSkills centre. 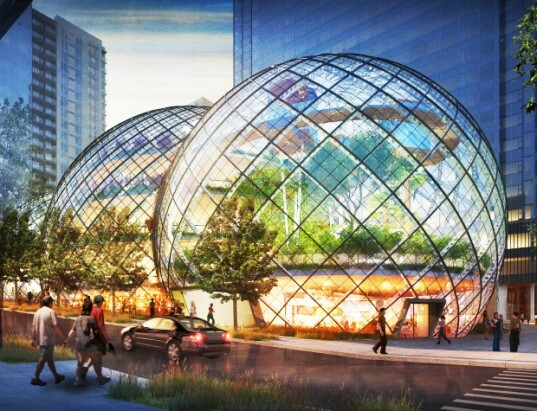 And, with the recent release of Amazon plans to build a trio of 65,000-square foot glass domes, it seems anything is possible. These ‘biospheres’ are set to be part of its new headquarters in Seattle to take on Apple’s plans for ‘spaceship’ headquarters in Silicon Valley, San Francisco.